In the wake of the floods that struck southern Alberta in the summer of 2013, the provincial government has introduced changes requiring homeowners in flood zones to make flood-mitigation upgrades in order to qualify for future assistance. If flood damage has forced you to rebuild your home, or if you’re interested in making renovations to protect your home from possible future flood damage, your floors are a great place to start. Numerous options are available for flood-proof floors in Calgary, including linoleum, tile, concrete, bamboo and rubber. You will notice that these five options eliminate carpet. As part of your strategy to flood-proof your home, you should eliminate carpet wherever possible, but especially in your home’s basement and ground-level floor. Carpeting traps moisture, which in turn causes a spike in your indoor humidity levels and makes it much more likely that you will develop a toxic mold problem. Toxic mold is dangerous to your health and is very expensive to remediate, and it’s something you want to avoid at all costs. With that in mind, let’s take a closer look at your options for flood-proof floors in Calgary. Many people confuse vinyl and linoleum, when the fact is that the two materials are very different. Vinyl is a mixture of harmful petrochemicals, and it’s to be avoided if you’re looking for eco-friendly floors in Calgary. Linoleum, on the other hand, is made up of ground wood, ground limestone, cork dust, tree resins, linseed oil, and colour pigments. Not only is it made primarily of natural, non-toxic ingredients, but it is both fire-retardant and water-resistant. Best of all, linoleum flooring is extremely durable and very easy to maintain. If you favour the sharp, sleek look of tile flooring, you have numerous options available. Ceramic tile is a common and affordable flooring material, which shares linoleum’s fire-retardant and water-resistant properties. However, if you’re looking for something a little different, you can also get glass flooring tiles which provide optimal protection against potential flooding. Glass floor tile also has a uniquely polished appearance, which can give your home a boost in the flair department. However, it is somewhat prone to scratching. Concrete is the most durable flooring option you’ll ever find, and it is impervious to water damage. What’s more is that concrete is very easy to maintain and will never need replacement. Many eco-friendly homes in Calgary feature bamboo flooring. Bamboo is considered one of the most sustainable construction materials on the market, as it is harvested from live plants that then simply regrow the wood that was taken. If you’re looking for a natural wood type of flooring but you want to do your part to fight deforestation, there may be no better choice than bamboo. Bamboo shares many of the physical characteristics of hardwood flooring. It is very easy to install and lasts for many years with easy maintenance. You can also customize it in a near-endless array of ways, so it can easily be integrated into any interior design or architectural style. If your heart is set on a traditional hardwood floor, you can still make an eco-friendly choice by opting for reclaimed materials. 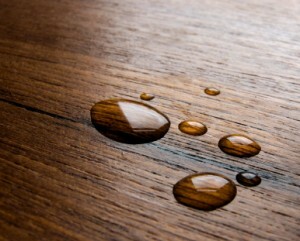 This extremely water-resistant material is gaining traction as a flooring option. Most rubber flooring is made from recycled tires, helping reduce waste through the repurposing of material that would otherwise be headed for your local landfill. Rubber flooring is very easy on your feet, and is naturally stain-resistant and durable. Like the other eco-friendly flooring options, rubber is highly customizable and is available in a complete range of patterns and colours. Questions About Eco-Friendly Floors in Calgary? Contact the Local Green Building Experts! If you are looking to build an eco-friendly home in Calgary, don’t hesitate to contact the green building experts here at Fine Line Homes. We are a leading builder of custom eco-friendly homes in Calgary and throughout southern Alberta, and we’re happy to explain the many exciting options available to homeowners who want to reduce their carbon footprints while lowering household energy costs.